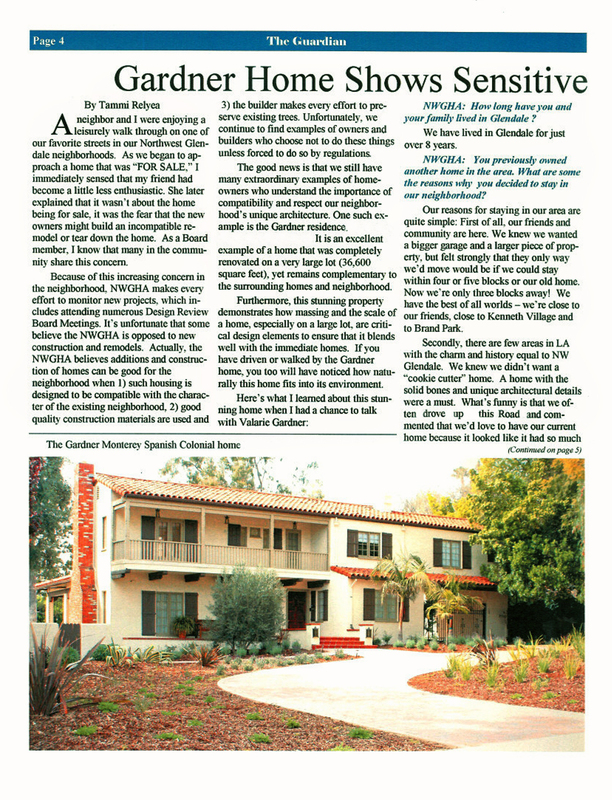 J & J Building Co., Inc. did two projects at our home in Glendale. The first was a fairly extensive refurbishment of many rooms in our house. They created built-in desks and cabinets, revamped trim, added decorative beams, hung new doors, etc. The second was the extensive remodel of our guest bathroom. They created a wonderful Japanese flavor room, with a cobble stone floor, sink and cabinet, and new shower--all with a Japanese design. 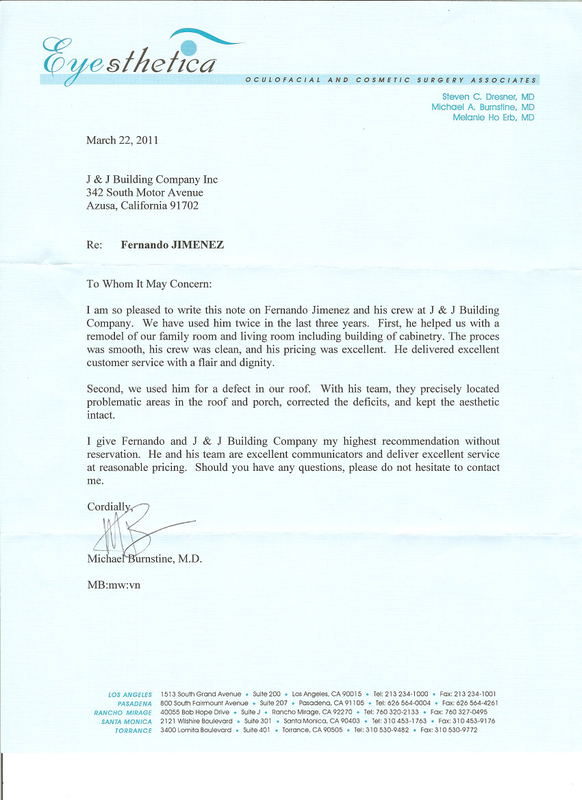 In both cases we were very pleased with the work, with the workers, and with the owner of J & J, Fernando. We would highly recommend J & J Building and will use them in future construction work. Fernando and J & J Building Co., Inc. completed a significant remodel to our home in San Marino. The remodel consisted of a complete renovation and expansion of our kitchen, laundry room, office, living room, dining room and two bathrooms. They also completely redid our front and back yards including an outdoor kitchen, pool and patio. In addition to the beautiful custom cabinets that they made for our kitchen and laundry room, they also built several additional built-ins including an entertainment system, hutch and wet bar. The remodel went extremely well and my wife and family could not have been more happy with the results. While it is impossible to complete a project of this scale without some bumps in the road, Fernando was so diligent about quickly resolving any issues, that you never felt alone or frustrated. I have the utmost respect for Fernando and his team and would highly recommend them to anyone considering a project large or small where attention to detail and quality craftsmanship is important. 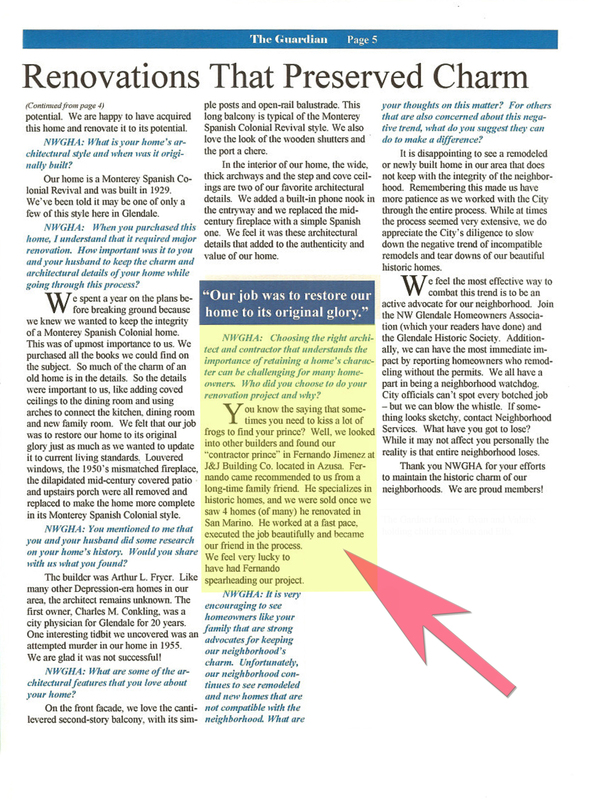 Fernando's experience as a carpenter and the fact that he does his own custom cabinet work is a huge plus. However, the greatest part of working with Fernando is that you can truly trust him. He goes out of his way to make certain that you are pleased with the project and he provides honest feedback and solutions with an eye on an excellent outcome while being mindful of costs. When we decided to remodel the kitchen of our Spanish home, Fernando Jimenez of J & J Building Co., Inc. was recommended to us by our designer. We were very pleased with the work. It was done in a timely manner and five years later, still looks beautiful. We were so happy with the result, that we recommended J & J to our daughter and son-in-law when they decided to remodel their kitchen. Once again they did an excellent job. J & J Building Co., Inc. is an amazing construction company and we highly recommend them. J & J recently performed extensive construction and improvements on my older home. Every step of the way, they informed me of what to expect, the time frames and how much it would cost. Their pricing is fair and they are reliable, neat and professional. I dreaded the idea of this huge construction project because many friends have told me their construction horror stories of delays, cost overruns or the contractor just walking off the job. None of that happened with J & J Building Company. In fact, I tell everyone what a great experience I've had and they look at me with envy. With large construction projects, there will be items that need to be addressed. Fernando handles any issues immediately and to the client's satisfaction every time. We had an issue with an installation and it was addressed within 24 hours. As a result of the unexpected deluge of rain, there was some leakage with the roof. It was handled as soon as the rain stopped. For a great experience with an experienced construction company, my recommendation is J&J Building Company. We bought our home about 3 years ago and decided to completely remodel it. We extended the back of the house to add a family room, expanded the kitchen and master, added a bathroom, reconfigured another, redid the laundry room and added a large covered patio. It was a large job and essentially there wasn't a room in the house that went untouched. We got 3 bids for the job and really did our research before hiring a contractor. Those stories about nightmare contractors are pervasive, and the last thing we wanted to do was to hire someone, pay them a lot of money and be unhappy with the job they did. The opposite couldn't be more true about Fernando Jimenez from J&J Building Co. Referred to us by a friend, Fernando impressed us from the start with his genuine demeanor and honest responses to our questions. 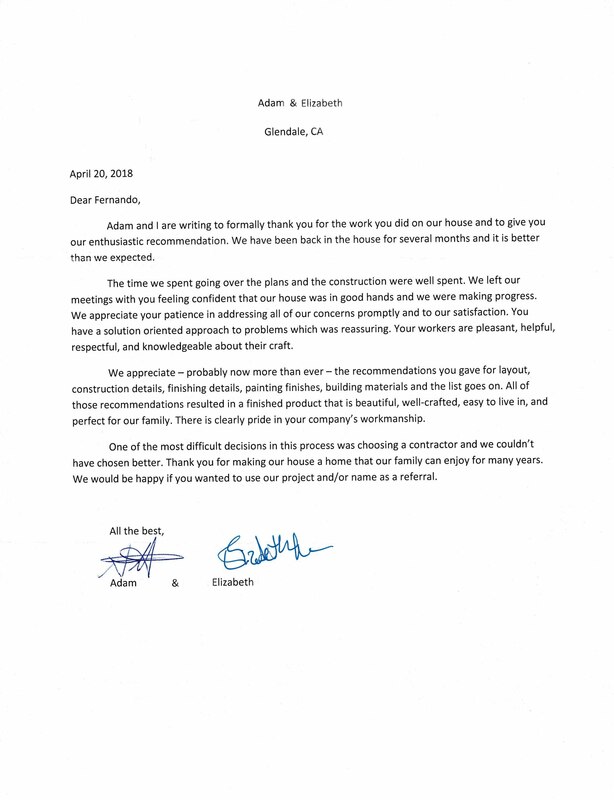 We toured numerous homes he remodeled in San Marino and after seeing his incredible work first -hand, as well as noticing the great relationships that developed between Fernando and his clients, we decided to go with J&J. His bid wasn't our lowest one, but we knew that he had integrity, did high-quality work and had true craftsmen working under him. And we've never regretted it for a moment. Most people cannot believe that we rave about our contractor. But why wouldn't we? He completed the job on time, was accurate when it came to pricing, was easy to work with and most importantly, did an amazing job on our home. We love every inch of it. 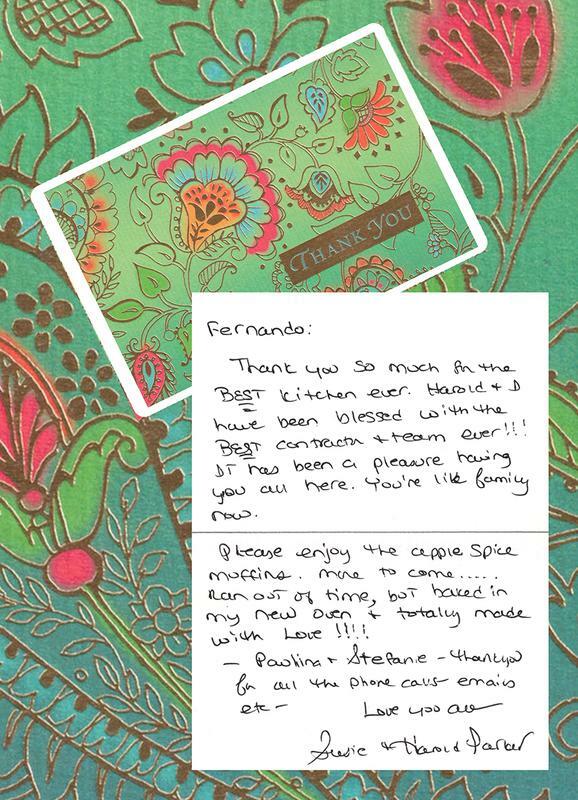 And there's not a day that goes by that we don't feel immense gratitude for Fernando and everyone from J & J Building. In 1991 we were referred to J & J Building Co., Inc. by colleagues who had engaged their services and were quite pleased with the results. We had just purchased a 1906 home in Sierra Madre which was badly in need of some home improvements, both structurally and cosmetically. J & J’s upgrade of an upstairs master bathroom was top grade and they transformed a decrepit downstairs bathroom to a fully functional, roomy suite. During this process, our home suffered significant damage during the Sierra Madre earthquake. To our surprise and delight, they arrived on property immediately following the quake to help us take stock of damage and lend support. We subsequently rebuilt our home with some minor additions, under the guidance, counsel, and expertise of the professionals at J & J Building Co. They have subsequently helped to expand and upgrade our current home in La Canada, CA from 1980 square feet to over 3000 SF, including magnificent enhancements of our kitchen and back yard. They have been there for us for over 20 years and have always been courteous and professional. They work with integrity. This is what we love to see ... a very satisfied customer. this article about them. Please click file links above the pages to view the full-size pages.